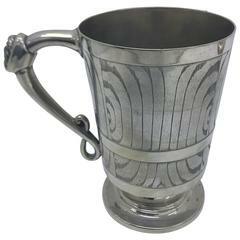 This is a delightful antique Victorian English silver plated engraved and embossed mug, circa 1870 in date. Condition: In excellent condition, please see photos for confirmation. Dimensions in cm: Height 13 x width 13 x depth 10 Dimensions in inches: Height 5 inches x width 5 inches x depth 4 inches Please feel free to email or call us to arrange a viewing in our North London warehouse. Shipping: We ship worldwide and deliver to Mainland UK addresses free of charge. A shipping cost to all other destinations must be requested prior to purchase. Delivery and return policy: We require that someone be home on the agreed delivery day if applicable, otherwise a redelivery fee will apply. In accordance with Distance Selling Regulations, we offer a 14-day money back guarantee if you are not satisfied with the item. The item must be returned in its original packaging and condition. Unless the item is not as described in a material way, the buyer is responsible for return shipping expenses. Buyers are fully responsible for any customs duties or local taxes that may be incurred on items sent outside of the European Union. An antique Victorian cruet set features silver plate carousel and having four pressed glass jars, 19th century. Measures: 10.5" H x 5.5" W x 5.5" D.
A 19th century elegant silver plate tea urn/ samovar with delicate floral engraving. By Elkington Mason & Co.